Molly Imel was like a frog in a biology lab for the better part of a decade. Surgeons worked her over from stem to stern. They probed and fused her spine; removed ribs and muscles; rerouted arteries, veins, and nerves. They left her with 50 inches of scars over the course of 10 operations. But they didn’t touch her heart. She was saving it for her next chance to coach soccer. That chance came last fall. 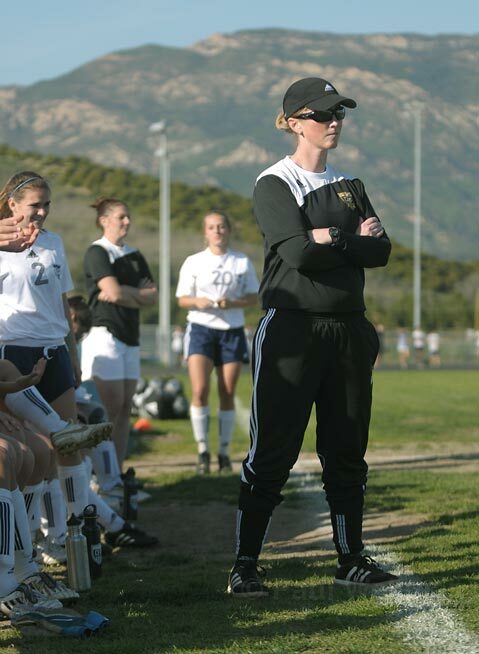 Imel took over the same Dos Pueblos High girls’ soccer program that she had brought to the brink of greatness in 2000-01. That season, her second as coach of the Chargers, they were runners-up in the Channel League to CIF champion Buena and made it to the second round of the playoffs, where they lost to Redondo, 1-0. Imel was not on the field that day because of crippling back pain. “I was wearing my full coaching gear in bed,” she said. “I coached via cell phone with my assistants.” It was the last game she would coach for almost nine years. Imel took a medical leave to deal with spinal damage and further complications that arose from a rare vascular nerve disease. She was in and out of hospitals, clinics, and rehabilitation facilities. She needed a wheelchair to get around. On better days, a walker or a cane would do. “I felt tremendous guilt when I left [the DP soccer team],” Imel said. “Every single year I thought of coming back.” But it was not until she came out of her 10th operation early last year that she began to feel up to the task. She made sure she would be able to give the same all-out effort that she would demand of her players. During the season, the DP girls beat Buena for the first time. They opened the playoffs by defeating West Torrance 2-0 in a wild-card game. They had to go on the road to play San Clemente, the two-time defending CIF Division 1 champion. Wild-card teams usually are easy pickings. (Santa Barbara High defeated wild-card Littlerock by a 9-0 score in the boys’ playoffs last week.) San Clemente led 2-0 at halftime, but Dos Pueblos got a goal from Maria Solis and pushed the Tritons down to the wire. As far as Molly Imel is concerned, the real story is not her triumphant return, but the way her players responded to it. She spoke effusively about senior defensive stalwart Kristen Witchey and goalkeeper Meagan Bellefeuille, who posted 12 shutouts while writing “believe” all over her mirror at Imel’s direction. The coach got some first-year girls to overcome their apprehension and play varsity soccer. They include Solis and Rachel Smith, “a born striker who sacrifices body, soul, and flesh to get to the ball,” Imel said. Throughout her physical ravages, the 38-year-old Imel never lost her passion for coaching, a career she began at age 18. She has conceived a “Sweet 16” list of character-building precepts that she expects her players to live by. “She coaches us to be our best,” said Erin Ristig, a junior midfielder. GAMES OF THE WEEK: Barb Beainy will be the first UCSB women’s basketball player to be honored as a Legend of the Dome on Saturday (Feb. 27) when the Gauchos host Cal Poly (2pm tipoff). Beainy, a talented guard with killer instincts, helped the Gaucho women claim their first Big West championship and an NCAA tournament victory in 1992. … A conference title is within the reach of this year’s Gaucho men. They have clinched a top seed in the March 10-13 Big West Tournament and an automatic berth in the semifinals. They will conclude the regular season at the Thunderdome next Wednesday, March 3, against UC Irvine. … Wisconsin, Memphis, and North Dakota State will be playing in the Gaucho Classic Softball Tournament at UCSB this weekend. … The Dos Pueblos girls’ water polo team entered the week two games away from a perfect season and its second consecutive CIF title. The finals are Saturday night in Irvine.